I read this series last year at the urging of a friend. He insisted that I would like them, and to my intense surprise, I really did! I had put off reading them because I thought they would be too "kiddie" for a 29 year old. The first three books are more on a children's level, in my opinion, and I thought them to be pretty simple. However, after book four the series really starts to take off. If you've seen the movies but not read the books, know that the books are MUCH better (seriously, when is that not the case?). By the fifth book I couldn't put them down, and book seven was outstanding. There's a reason why these books have been a worldwide phenomenon---JK Rowling is an excellent story teller. The ending of book seven was too spare. I wanted to hear more about them as grown-ups! I know, they are so well-written. She did a great job on it. "The ending of book seven was too spare. I wanted to hear more about them as grown-ups!" Yeah, I wanted too:) Guess what, there's more. 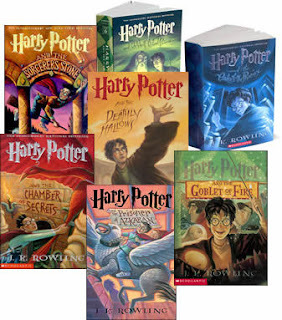 Go to www.jkrowling.com, the author has posted there some details about what their lives as grown-ups would be, in the Extra Stuff section. and can you believe she came up with these stories in a pub, or was it a coffee house *scratches head* no matter, they are still great. I hated how they came out slowly though, i had to always re-read the previous book when the new one comes out like a year after. but JK Rowling is still epic for these series!